Blog – The Caster Store, Inc. 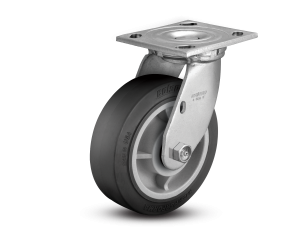 There is no simple formula or rule that can be followed in selecting the proper casters. Many varying and individual factors must be balanced to make the selection that will do the best job for you. The following are several of the more important considerations. Load Weight. The heavier the load, the larger the wheel required for the caster. The weight of the load also influences the mobility of the wheel. Roller or ball bearings are recommended for loads over 400 pounds. Weight capacities are shown for each caster in this catalog. Floor Conditions. Make sure the wheel you select is large enough to pass over cracks in the floor, tracks, moldings and other obstructions. For floor protection on linoleum, tile, carpet, etc., use polyurethane or Performa rubber wheels. Unusual Conditions. Each wheel material has certain characteristics which will give the best results where unusual conditions exist. For example, where acids, oils, chemicals and other conditions harmful to rubber are present, Colson polyurethane, polyolefin, Maxim, phenolic or steel wheels are recommended. Check conditions, then select caster and wheel. Rolling Ease. The larger the wheel diameter, the easier it rolls. Roller bearings carry heavier loads. Ball bearings roll easier but carry lesser loads. When possible, use the largest ball bearing wheel for best results. Extreme Climates. Room temperatures are no problem for most casters. But extreme cold or heat can be a problem. Colson helps solve this problem with “Colson 45”… the green lube which assures caster rolling ease from 45°F below zero to 260°F above. It’s standard on all Colson casters. (Note: Some wheel types should not be used in extreme temperature ranges.